Note: Media outlets wishing to cover this event are asked to contact Laura Kraklau to be added to the list and to obtain information about coverage restrictions set by the speaker. 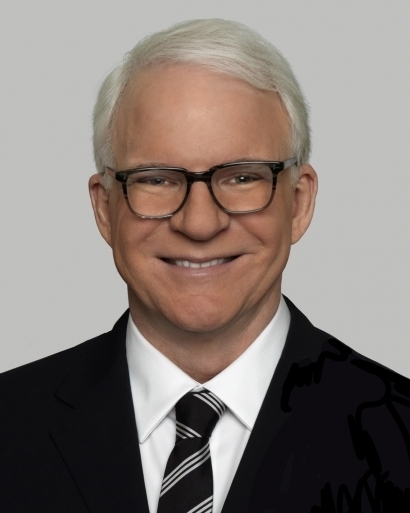 Steve Martin is one of the most well-known and pervasive talents in entertainment. His work has earned him an Academy Award®, five Grammy® awards, an Emmy®, the Mark Twain Award, and the Kennedy Center Honor. Martin began his career on The Smothers Brothers Comedy Hour (1967-1969), for which he earned his first Emmy Award for Outstanding Writing Achievement in Comedy, Variety or Music in 1969. In the mid-1970s, Martin shone as a stand-up on The Tonight Show Starring Johnny Carson and NBC’s Saturday Night Live. Martin’s films are widely popular successes and are the kind of movies that are viewed again and again: The Jerk (1979), Planes, Trains & Automobiles (1987), Roxanne (1987), Parenthood (1989), L.A. Story (1991), Father of the Bride (1991), and Bowfinger (1999). As an author, Martin’s work includes the novel An Object of Beauty; the play Picasso at the Lapin Agile; a collection of comic pieces, Pure Drivel; a bestselling novella, Shopgirl; his latest play, Meteor Shower; and his memoir Born Standing Up. His writing often appears in The New Yorker. Steve Martin is also an accomplished Grammy Award-winning, boundary-pushing bluegrass banjoist and composer. In 2013, Steve Martin released his third full-length album called Love Has Come for You, a unique collaboration with songwriter Edie Brickell. Love Has Come for You, won a Grammy® for “Best American Roots Song” for the title track and inspired the Broadway musical Bright Star. Bright Star received five Tony Award nominations and also received Outstanding New Broadway Musical and Outstanding New Score at the Outer Critics Circle Awards. Martin and Brickell’s second album together, So Familiar, was released on Rounder Records last October, featuring 12 remarkable new songs that bring the acclaimed duo’s musical collaboration into fresh creative territory. The presentation is open to members and the public. Public ticket options include Grand Upton Hall Dinner ($93), Grand Upton Hall Speaker-Only ($70), or Mainstage Theatre ($50) tickets. Grand Upton Hall doors open at 5:30 pm, Mainstage doors open at 6 pm, and the presentation begins at 7 pm. Details about each ticket level are available at TheEconClub.com. Tickets may be purchased at www.TheEconClub.com/single-ticket-pricing,by calling 269-927-8700, option 1, or in person at The Mendel Center Box Office. The box office is open weekdays from 10 am to 6 pm. Silver Beach Pizza, Merrill Lynch – Chris Adams, and Fairmount Santrol are sponsoring this Economic Club of Southwestern Michigan Speakers Series event. The Mendel Center is 30 minutes from Niles and 40 minutes from the Kalamazoo and South Bend areas. It is located on the Lake Michigan College campus at 2755 E. Napier Avenue, Benton Harbor, Michigan, one mile east of I-94 (Exit 30) and one mile west of the US 31 Bypass (exit 24). Its GPS mapping address is 1100 Yore Avenue, Benton Harbor, MI. Click the pages below to view Escape magazine. Click the pages below to view Faces of Cornerstone magazine.